Four APS Fellows have been selected to receive the APS Mentor Award, given each year in recognition of APS members who masterfully help students and others discover their own research and career goals. Beyond their individual contributions to diverse areas of research, such as the science of motivation, memory, social and cognitive learning, and education, these scholars’ dedication to their students and colleagues has fostered a thriving community of psychological scientists. 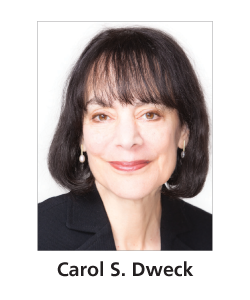 An APS James McKeen Cattell Fellow, Carol Dweck has dramatically advanced the study of motivation and resilience. What most characterizes her research, in addition to theoretical depth and methodological rigor, is its origins in a vibrant and collaborative laboratory that propels researchers to become leading scholars both within and beyond academia. Her mentees appreciate Dweck for her openness to ideas as well as her razor-sharp focus on identifying students’ skills gaps and training them to improve these areas. APS Fellow Kristina Olson of the University of Washington remembers the invaluable writing help she received from Dweck. 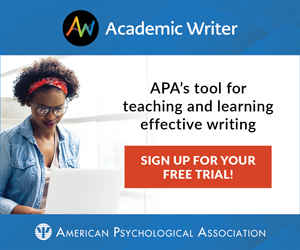 “When Carol returned papers to me she didn’t just make corrections or re-write sentences, rather Carol filled the pages with comments about why my writing was working or wasn’t (yet) working in particular places,” Olson, who last year became the first psychological researcher to win the prestigious Alan T. Waterman Award, writes in a letter supporting Dweck’s nomination. Dweck’s famous scientific insights into growth mindset, the useful belief that achievements can be borne of hard work and learning (as opposed to fixed, natural gifts), are applied in real time in her lab, her mentees say. She pushes her lab members to set the standard for evaluating the reliability and replicability of findings and corrects the record when the research is oversimplified or misinterpreted, they say. “She has an unbelievable gift in her ability to offer strong critiques (I cannot count the times in lab someone got stopped on a title slide for a correction) yet not do so in a way that feels as though one is being torn down — instead one feels stronger and smarter (in a non-fixed way),” psychological scientist Aneeta Rattan of London Business School writes in her letter nominating Dweck for the award. Regardless of other demands, she is known for making time to regularly meet with her students, offering them her total attention and focus. She encourages them to pursue “risky research” that has high potential for theoretical and societal impact. Many of her students identify her as the most influential person in their career path. 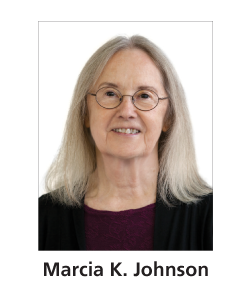 APS William James Fellow Marcia K. Johnson is a prolific contributor to cognitive psychology and cognitive neuroscience. She has explored aspects of memory and is best known in the scientific community for her influential source-monitoring framework, which seeks to explain how humans distinguish between the sources of their memories — including dreams, imagination, and reality. Among her many former students around the world, however, she is best known for her inexhaustible generosity as a mentor. They extoll the way she nurtured them not only as scholars, but also as whole people. Her mentoring style is described as reflecting an evolving relationship with each student. She begins as their tutor, providing opportunities to collaborate while modeling professionalism and perseverance. Gradually, she assigns new responsibilities, giving them space to grow but coming to the rescue when necessary. Later, she fosters collegiality based on mutual respect, inspiring self-confidence as students leave to pursue their own aspirations. Through it all, Johnson instills in her students a fundamental respect for the scientific method. She is particularly adept at encouraging her students to achieve broad interests and deep analytical skills through collaboration with colleagues and lab mates. “On a given day she’d have me brainstorming with the rest of her team to ensure the cohesiveness of the lab’s multifarious projects, collaborating one-on-one to revise a manuscript or design a new experiment, visiting a colleague’s lab to format data tables for a joint grant application, analyzing data for my dissertation, and trying to stay awake in an fMRI scanner for a middle-of-the-night research session,” Reeder recalls. Johnson’s scholarly renown is illustrated by her long list of prestigious awards, but her legacy as a mentor, her former students say, is the one that seems most important to Johnson herself. 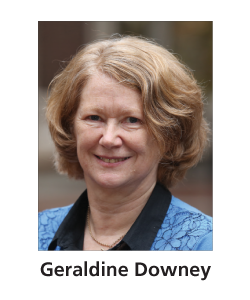 APS Fellow Geraldine Downey studies the psychological impact of personal and status-based rejection — how rejection relates to intimate relationships, child development, academic achievement, violence, personality disorders, and reentry following incarceration. In addition to producing creative and highly regarded research, Downey has transformed the nature of mentoring in science, focusing on students from groups that have a history of being marginalized in society. Downey stands out as a mentor based on the institutional structures she has established. She proposed, developed, funded, and ran a postbaccalaureate program in Columbia’s psychology department, providing college graduates with help to prepare for graduate school. She also founded Columbia’s Center for Justice, a project that harnesses education, research, and policy to promote alternatives to mass incarceration and that provides college courses in prisons and jails. At the Center, she has brought together people returning from incarceration, Columbia students, community members, and policymakers to create mentoring opportunities. Her graduate students over the years have said that they appreciate her for setting high standards and for encouraging them to think not only about basic empirical questions but also about the value, impact, and importance of their research to society at large. Many of Downey’s students have become preeminent scholars at the world’s most prestigious universities, but her mentees also include professional football players, social workers, students who left academia to have a direct social impact, and leaders in criminal justice reform. 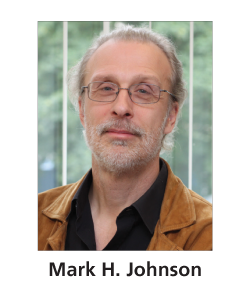 APS Fellow Mark H. Johnson’s innovative research includes paradigm-changing work on how genes shape the development of neural networks early in life, as well as in-depth study of how the brain guides social and cognitive learning in typically and atypically developing children. Over 30 years, Johnson has mentored 38 PhD students, 33 postdoctoral researchers, and 10 independent research fellows. But Johnson’s mentoring impact does not stop at graduate students and postdocs. He has also advised new faculty on how to balance teaching, research, and administrative responsibilities to promote their own professional development and well-being. In nominating Johnson for the APS Mentor Award, APS Fellow Denis Mareschal says Johnson stands out as someone who listens to the needs of individuals and astutely helps them see what is in their best interest. Johnson’s colleagues and mentees say his remarkabke scientific achievement may be outshined by his lasting achievements in fostering so many careers. Geraldine Downey, Carol Dweck, and Marcia Johnson will reflect on their experiences as mentors during a panel discussion at the APS Annual Convention, May 23-26 in Washington, DC. Mark Johnson is unable to attend the convention, but will be with us in spirit. Mark, I was so happy to hear about your mentor award!. Also, I would love to see you sometime. I am now permanently living in London.So can we possibly get together sometime? Do you still come here sometimes? Let me know if we can get together.